CONTACT US IF YOU NEED ASSISTANCE with storm damaged trees. Emergency Storm Damage Tree work is our bag. We have access to a huge variety of rigging and stabilisation equipment to make storm damaged trees safe. Sherbrooke Tree Service is turned to by contractors nationally for dangerous trees, storm damage and emergency works. We are a light weight, highly experienced organisation that has built a business around complex tree removal for over 35 years. 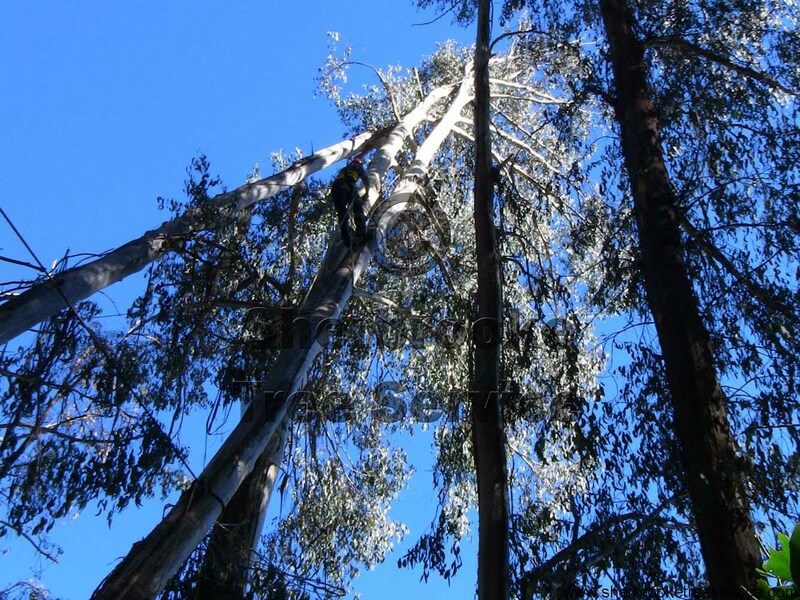 Our equipment surpasses many of the large tree organisation and the experience housed in our small crew is incomparable with most tree practitioners. When a storm hits, our company is the goto for fast, safe response. Trees on homes, caught up in other trees, splitting and tipping out of the ground are all part of what we do. We have access to heavy cables used in skyline operations that can lift whole trees, helicopters, tree jacks, slings and 50+ ton lifting pulleys. In extremely hazardous situations, we use explosives to remove or reduce the hazard to a manageable level. Cost varies significantly from job to job. Sometimes we cannot safely complete the job in the weather conditions, we decide this on each job. Often we can stabilise the job and make safe for completion in better weather and daylight. We provides quotes prior to commencing any work, and can discuss with you the options available.